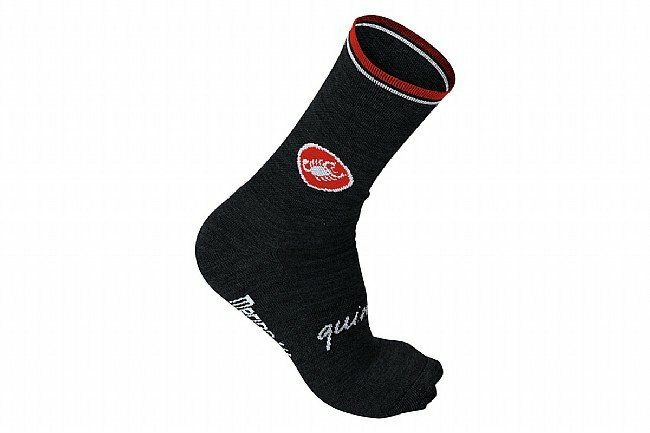 These high-performance Quindici Wool Socks from Castelli are made of a soft Merino wool blend and feature a tall 15 cm cuff for full-length protection and warmth. Warm and comfortable. My favorite sock for temps in 40s and below. Good look, as well. Use when temperature goes below 60 degrees. Really nice pair of socks and the price was right. These are a lot of money but no more than other wool socks and with the great style of Castelli. Other than really cold weather these are adequate for my needs and as stated above I never machine dry. Length is perfect and I like the anthracite color. Lg fits my size 942 just right. Alway line dry. My go-to sock now for the 3 seasons. The Gregge's are great too, but I like the longer cuff on these. Thanks Castelli for making a great mid-tall wool sock. Like the socks. They are very comfortable. Also they look great! I ride a lot in the winter here in Utah as long as the roads are clear. Ive been out in 20 degree weather and these wool socks from Castillo keep my feet nice and warm. They ate great under shoe covers and standard cycling shoes. These socks are very comfortable and warm. I have worn them several times, no complaints. I own several different wool socks but this Quindici Castelli are the softest feeling wool I have ever tried, do it!!! Extra tall to keep your feet and legs warm with knee warmers. Like the extra padding.